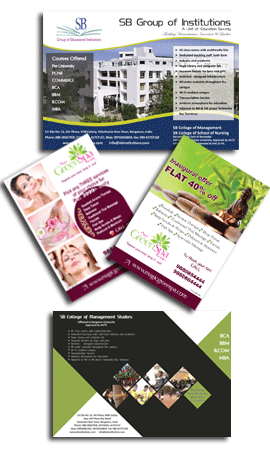 When it comes to promoting and marketing products and services of businesses flyers is an effective tool. If you want an alluring and attractive flyer then opt for best graphic designing services. At ClickPoint, we design flyers to meet marketing need of our clients. We are a reputed name in the arena of flyer designing at an affordable price range. The aim of our flyer design service is to represent the vision and mission of a company in an attractive and innovative way. Our stunning creation is available in different colors and shape. Design and graphics used in these flyers aim at influencing the purchasing decision of target audience. Owing to our creation, we are now recognized as one of the best outsourcing graphic designing company. During the designing process, our experts create compelling and crisp content to create a mark on our target audience. Through the text used in these promotion materials, our experts try to incorporate history, vision and mission of our clients. This approach makes our flyer design service one of the best in the league. Designers, artists and professionals writers form a team and create a crisp and attractive flyer for our clients. Superior quality and customized designing services make us different from others. Our team of professionals is equipped with latest tool of designing to create an effective designs and layout. Unique designs are assured with our designing services. If you are in need of glossy and colorful flyers then avail our exclusive services of flyer design for printing. We follow the specifications of clients ardently throughout the designing process and ensure satisfaction of clients. Nothing can be more powerful than communication about your services than through a well-designed and colorful flyer. So, if you want a full-proof marketing mix then opt for our designing services immediately.